This is the water you hear sloshing around inside the coconut when you shake it. It is commonly referred to as a natural sports drink or natures Gatorade because it contains electrolytes which is extremely hydrating. The water is completely sterile fresh off the tree as it is filtered by the shell. It has been used successfully intravenously in emergency situations. See PubMed. It is mildly sweet and though strange tasting at first, it has a tendency to grow on you and become deliciously refreshing in its natural state. You can add a little coconut palm sugar (see below) raw honey, stevia or sweetener of choice with lots of ice to help you get accustomed to the taste. It’s also great as a base for smoothies and many other beverages. Coconut milk comes from the grated meat of a coconut and has a richer taste than other nut and seed milks, due to its higher fat content. The standard commercial coconut milk fat content is 17% and is considered a healthy fat. Fresh coconut milk is relatively easy to make and is becoming more and more popular to make it fresh in you own kitchen. There are two ways to make it. 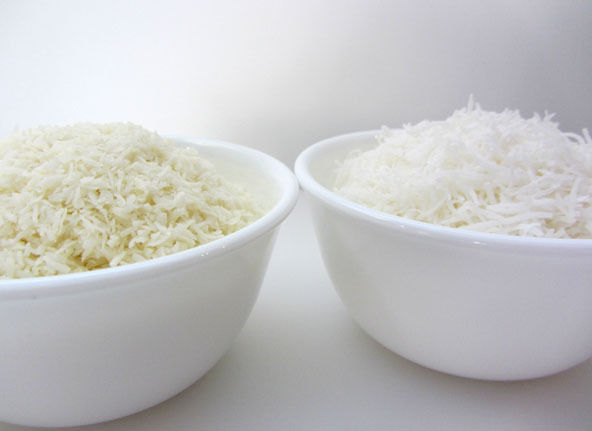 One way is to use dried, shredded or desiccated coconut from the store and the other is to use the coconut meat fresh out of a mature coconut. Either way, put the coconut meat in the blender, add the coconut water you removed from the coconut or use pure water, blend well and strain the liquid out through a nut milk bag or cheese cloth. The separated liquid is now coconut milk. See recipe for Coconut Milk. Coconut milk is mildly sweet and similar to cow’s milk in consistency when made with the right amount of liquid. It is becoming increasingly popular in the western world with Vegans, Raw foodists, Paleos, people allergic to animal milk and anyone who is health conscience. You can easily find convenient canned coconut milk in stores but be careful to check the ingredients for unwanted additional additives. Canning methods with high-heat and cans lined with bisphenol-A are a big concern. Some people don’t like the taste of canned milk and this would include me. If you are like me and don’t like coconut milk from a can, try coconut milk in Tetra Paks like the juice boxes come in. It tastes fresher and has very little separation according to Wilderness Family Naturals. I have made it fresh many times (because I don’t like it any other way) See recipe for Coconut Milk until I discovered I could avoid all the hassle and buy it frozen at my local Asian Supermarket. Its only $1.69 for 16 oz (2 cups) which is a better price than canned. The only drawback it that it takes up precious freezer space and takes time to thaw out. But I now keep some in stock to make sure I can make Homemade Ice Cream at a moments notice. See just one my kids’ favorite ice cream recipe or search “coconut milk” and “ice cream” to find them all. How long does coconut milk last? 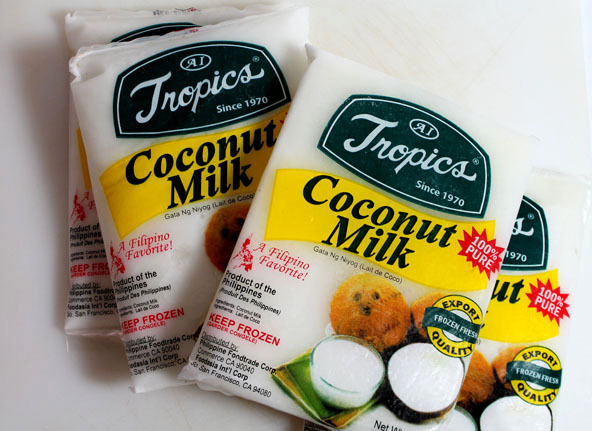 Coconut milk doesn’t last long once you have opened the can, tetra pak or bag of defrosted frozen coconut milk. It should stay fresh maybe three days in an airtight container in the refrigerator. So if you are not using the full amount of opened coconut milk, be sure to add the rest to your smoothies or soups within the following few days. You will know when its gone sour. You can taste and smell it. 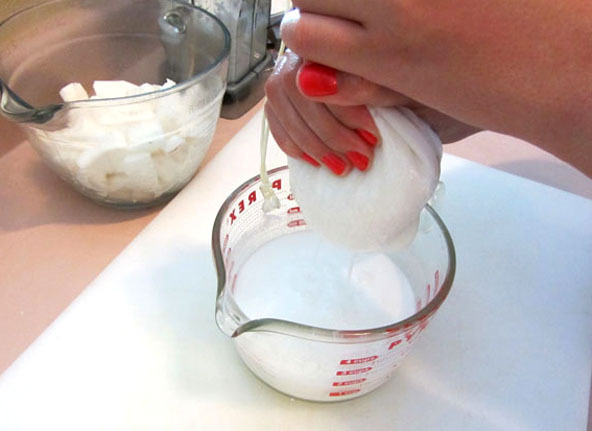 You can always freeze the remaining coconut milk in a baggie or ice cube trays for future use. It’s so good for you, try not to ever waste any of it. 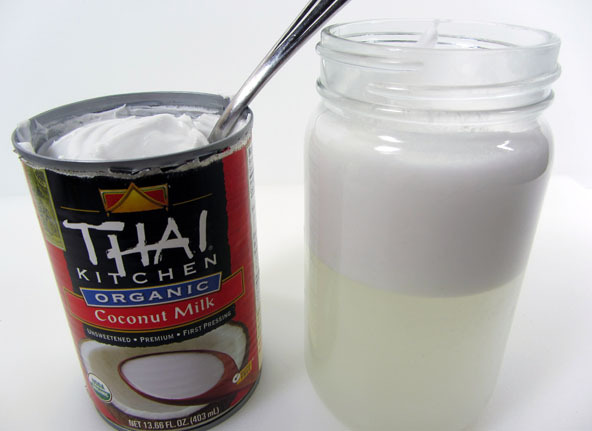 The jar shows the separation of the cream from homemade coconut milk. The canned version is thicker because it has been heat treated for the canning process. Whether you purchase canned coconut milk or make it fresh, when it sits for sometime it will separate (especially when you put it in the refrigerator on purpose to get it to do this quickly). The thick creamy part that rises to the top is coconut cream. Scoop the cream off the top to use in recipes that call for coconut cream. Don’t fall for the reduced fat coconut milk, remember this is a healthy fat not to be feared. If you don’t want coconut cream, just blend it back into coconut milk, just like we use to have to do with the cream that floated to the top of raw milk. You can find both coconut cream and coconut milk in tetra packs but the coconut milk in tetra packs won’t separate into cream like it does in canned, neither does frozen (thawed and refrigerated) coconut milk. Coconut cream is used in many traditional dishes from countries populated with coconut trees and is currently popular as a non-dairy healthy cream substitute in recipes especially for vegans. 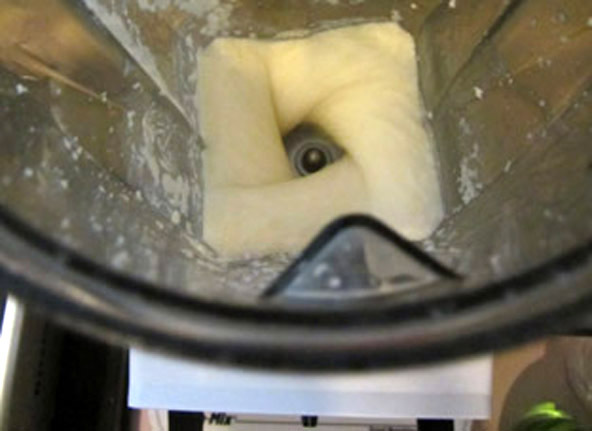 See recipe for Whipped Coconut Cream Filling or Frosting. Coconut butter is made by blending or grinding full-fat, unsweetened, dehydrated (desiccated) coconut meat in a high powered blender. That’s it. It is similar to blending or grinding nuts into nut butter. It has all of its original fiber, oil and nutrients. It is runny when warm and hard as a block when cold due to the nature of coconut oil. 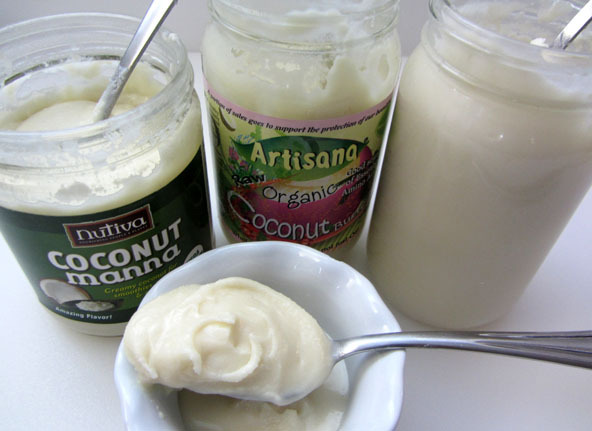 To get it to a soft spreadable consistency, place the jar of coconut butter into a bowl of hot water until it softens. If you are not familiar with coconut butter, it is an amazing, versatile, whole and healthy food. It is used in Indian, Tai and Asian savory dishes, used as a non-dairy creamer as well as confectionery recipes such as cookies, candies, fudge and frostings. Honey or other sweeteners are usually added to it as it is not very sweet on its own. I must warn you upfront however, coconut butter can be scrumptiously addictive. Here is a great recipe: Manna Candy. Coconut Manna is a commercial name for Coconut Butter made by Nutiva. I personally believe that Coconut Butter and Coconut Manna are the best names for this product. Calling it Creamed coconut or Coconut Cream Concentrate just creates confusion. Since Coconut Butter is made just like any nut butter then why call it anything else? I believe it is a translation problem that will clear up here shortly as it becomes more and more popular. So for now, watch out for its confusing names and when in doubt, ask the recipe author for clarification and read ingredients on coconut products to know what you’re really getting. 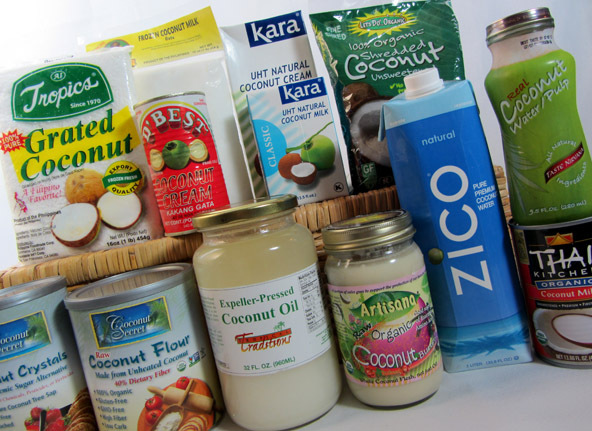 Beware of coconut products that add sugars, milk powders and other undesired additives. I recommend Coconut Manna and Artisana Coconut Butter brands. See recipe for Homemade Coconut Butter. This is the grated meat from the coconut which is then dried to a 3% moisture content. It can be found in a fine grade or medium grade. It can also be found as shredded or flaked coconut which are just different shapes and sizes of dried coconut. 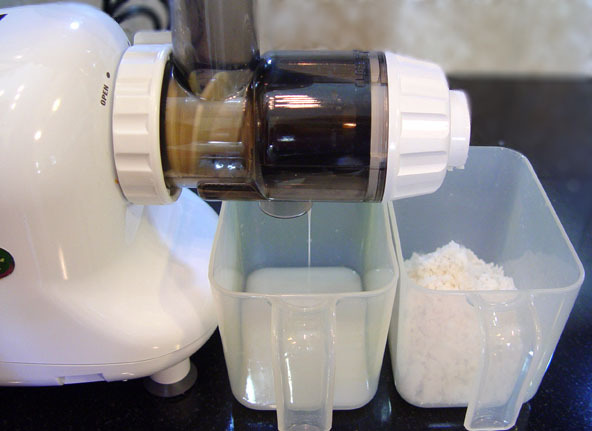 The fat content of full fat desiccated coconut oil should be a minimum of 60% fat. This is the best tasting and most popular form. A reduced fat desiccated coconut will have less fat and not taste nearly as well. In fact I personally think it tastes like cardboard and couldn’t figure out why anyone would want to buy it until I discovered that you can make coconut flour from it. 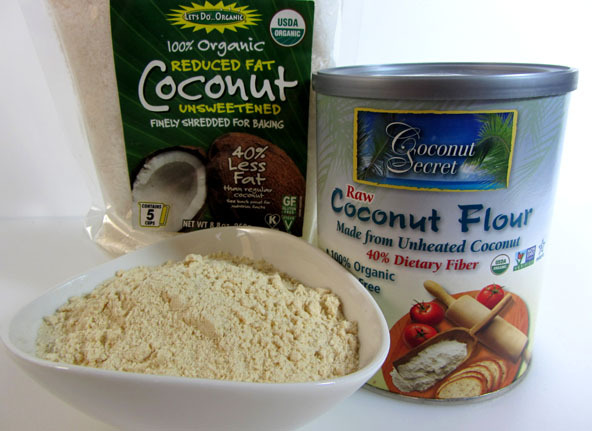 Full fat desiccated coconut blends into coconut butter and reduced fat desiccated coconut grinds into coconut flour. Be sure to look for unsweetened desiccated coconut and check for any other unwanted added ingredients. Here is a brand that I recommend. Just make sure you do not get the reduced fat version (It taste like cardboard without the natural healthy fats which we want anyway). Or you can make your own, here’s how: Recipe for Desiccated Coconut. You may want to try this recipe for macaroons. This is the oil extracted from the meat of matured coconuts through a dry or wet process. See article Coconut Oil – The differences between Refined, Virgin and Extra Virgin. Coconut oil was once wrongfully labeled as a dangerous oil but has since been redeemed. See article Coconut: In Support of Good Health by Dr. Joseph Mercola. The medium-chain fats in coconut oil are considered so healthy and important that they are used in baby formulas. Coconut oil has a relatively high smoking point and varies depending on origin and refinement (350 degrees F for Virgin (unrefined) & 450 for refined) but more importantly due to its saturated fat it becomes less damaged than other oils when heated and therefore is the best cooking oil available. Save your heart healthy olive oil for your non cooking needs like salad dressings. For more info on the benefits of coconut oil, you may want to read this article from the Huffington Post: Coconut Oil Benefits: When Fat is Good For You by Dr. Joseph Mercola. Some people refer to Coconut oil as coconut butter because coconut oil resembles a butter texture when it solidifies. Coconut oil is unique as it is a solid in cold temperatures and starts to become a liquid above 76 degrees F. But coconut oil and coconut butter are completely different and usually cannot be interchanged in a recipe. So when you see coconut oil/coconut butter listed together in a recipe, it’s likely meant to be coconut oil as some people are mistaking them to be the same thing. But to know for sure, its best to ask the recipe author for clarification. This is a gluten-free and grain-free flour loaded with fiber and protein. It is made from the “residue” or leftovers from making coconut milk. When most of the fat is removed from the coconut meat when making coconut milk, the residue left over can be dried and milled into flour. It will take more than one milking of the coconut meat to reduce the fat content sufficiently but it can be done. This flour meets the needs of the Paleos and the Gluten-Fee. Because it contains over 19% non-gluten protein, it is used as a protein powder and added to shakes and smoothies. It can be used as a thickener in soups and sauces and in many baking recipes. Once coconut milk is made, emulsifiers are added such as maltodextrin and sodium caseinate (not Vegan). It is then pasteurized, homogenized and spray dried. “It is scientifically impossible to have pure 100% Organic Coconut Milk Powder according to Enerhealth Botanicals. Their website states: “We strive to offer products free of emulsifiers. We feel that the benefits of the Coconut Milk Powder outweigh the tiny amounts of emulsifiers in this product. We are working diligently in R&D to remedy this situation”. If you have ever checked ingredients in standard supermarket non-dairy creamers, you’ll find; partially hydrogenated oils, sugar, corn syrup, sodium caseinate, dipotassium phosphate, mono and diglycerides, natural and artificial flavors and colors. 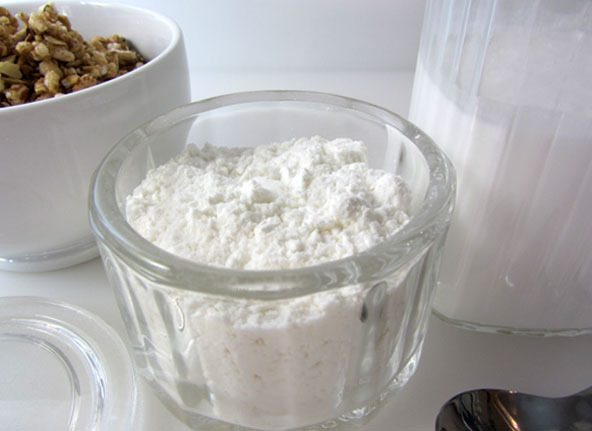 It becomes obvious that Coconut Milk powder is a much better alternative as you move closer and closer to eating as whole and clean as possible. FoodWise has a Vegan Coconut Milk Powder. 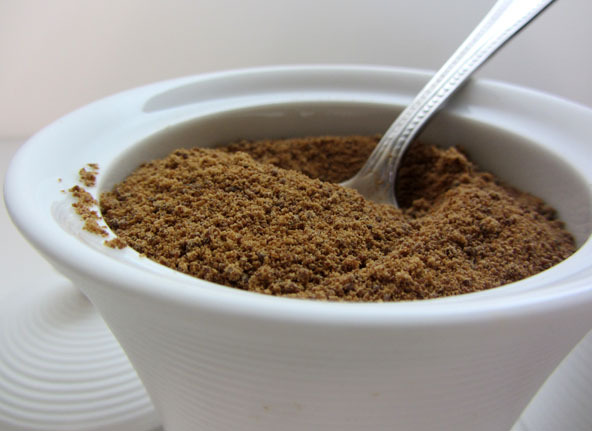 Coconut Sugar is minimally processed and has been made in a simplified manner for centuries. It is still being made by hand in Asian countries like the Philippines and Indonesia and could even be made in your own kitchen without any other special equipment. It comes from the sap of cut flower buds that grow in clusters out of the coconut palm tree. This light colored translucent sap is collected twice a day producing sap over a 40 day period. Coconut sugar cannot be made from fermented sap so it is collected and heated each day to evaporate the moisture. Modern facilities now use air dried systems. The color, sweetness and flavor can vary depending on the coconut species, the harvest season, and how it was reduced. It is reported to have a low Glycemic Index of 35. Un-like Agave that is mostly dangerous fructose (see article on agave), coconut sugar is mostly sucrose with a small amount of glucose and fructose. In case you are wondering, it doesn’t have even a hint of a coconut taste. It is sweet, with a light caramel taste similar to brown sugar. It can be used 1:1 in the granulated form with brown sugar and 1:1 in the syrup form with honey or maple syrup however it is not acutely as sweet. It also contains its original nutrients of vitamins B1, B2, and B6, potassium, magnesium, zinc, and iron with 16 amino acids being highest in Glutamine according to The Philippine Coconut Authority. 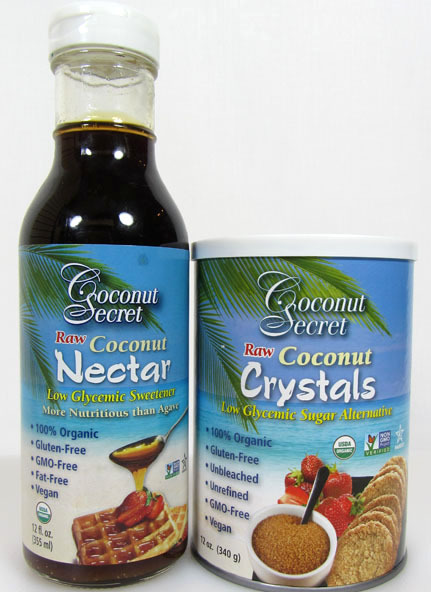 Coconut Secrets call their coconut palm sugar “Raw Coconut Crystals”. They claim to use a special vacuum evaporation equipment to turn and dry the coconut sap without the use of high heat. The sap is only heated to approximately 105 degrees. This makes the Raw Foddies very happy as anything under 118 degrees is considered raw. It should make anyone happy because low heat keeps it closer to its natural state with its natural enzymes and nutrients intact. Madhava brand is a good brand. There is a difference between Coconut Palm Sugar and Palm Sugar even though the two names have been used interchangeably throughout Southeast Asia. Palm Sugars are not from the Coconut Palm Tree (the Cocos Nucifera tree) where we get Coconut Palm Sugar but are from the Palmyra/Borassus or from the Aren palm tree. These two palms bear different fruits but the sap is tapped and reduced in the same manner as the Coconut Palm Sugar. Some importers are labeling their Palm Sugars as Coconut Palm Sugar when they are not. 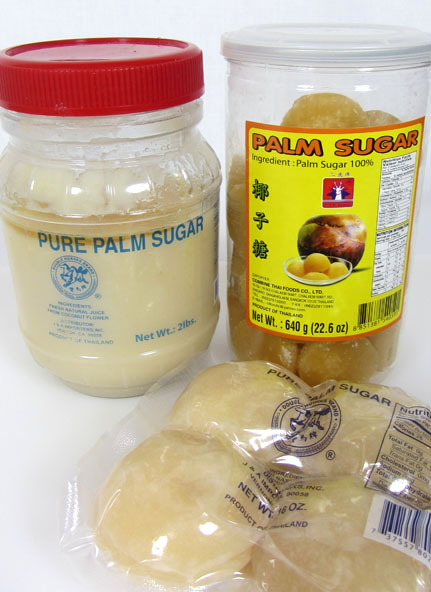 The Thai Palm Sugar is known to be mixed with refined cane sugar. I found this out the hard way by purchasing some and discovering it tasted almost identical to refined sugar. Not every country has strict labeling laws and the enforcement of it. We know how much we struggle with label laws here in the US as we are currently asking for the right to know if our produce is GMO (a Genetically Modified Organism) or not. It’s hard to believe that in 2012 we still have to put up a terrible fight for a labeling law that should have already been implicated upon the onset of creating GMO’s without our knowledge. This photo shows products purchased from an Asian Supermarket. The ingredients on the jar with the red lid containing a thick paste of palm sugar and the package of solid disks in front both state: Fresh natural juice from coconut flower. The other states: Palm Sugar 100%. All are a product of Thailand. You will find products claiming to be 100% pure coconut palm sugar or palm sugar but unfortunately this is not always true. Although people have been making and using 100% pure palm sugars for centuries, somewhere along the way people started adding in cane sugar and no one is the wiser. This includes the store manager when I questioned him about the authenticity of the palm sugars before I made my purchase. He reminisced how his family use to make their own palm sugar from their backyard palm trees in Cambodia. He must have forgotten it turns a deep caramel color when reduced down. More research has taught me that when the color is light blonde and doesn’t have a distinct caramel flavor and tastes suspiciously like white sugar, it can’t be pure 100% palm sugar as labeled. I watched a number of videos from tourists watching people making palm sugars and sure enough, refined sugar syrup is sometimes added. Here is a video on making palm sugar if you’re interested to see how it is traditionally made (except for the addition of refined sugar). And here is a website showing how to make organic coconut sugar all the way into granules. So if you want to get the real deal with all its nutrients intact with a slightly lower GI level, be sure to purchase your coconut sugar from a reputable source. And as just a reminder, it’s still sugar. Even though it tastes crazy good don’t go crazy using it. Brian W. Shilhavy, BA, MA of Tropical Traditions reports that coconut palm sugar is quite costly both monetarily and environmentally. He claims; “When the sap used to make coconut palm sugar is collected from the coconut palm tree, from the flower bud that will eventually form a coconut, that tree can no longer produce coconuts!” Coconut trees in the Philippines have been on the decline for decades, and the coconut oil from coconuts is also now valued as a fuel source in bio-diesel production, resulting in less coconut oil availability as a food source each year. “As it stands now, coconut palm sugar is not a sustainable industry.” “The Philippine Coconut Authority in the Philippines is wisely recommending people to plant coconut trees especially for coconut sugar production, particularly the “dwarf” breeds that are shorter and can grow faster (average of 5 years instead of 10 years”. Read more here. However, JC Organics a producer, supplier and exporter of organic coconut sugar from Indonesia disagrees. They tell us that each coconut tree has at least 3 spadix (groups of flower buds that can grow from 5 to 10 coconuts). The sap is extracted from 2 spadix leaving at least 1 spadix to bear coconuts. But that’s not all, they claim that these two spadix, after they are used, will be replaced by new spadix every 40 days which will be able to grow coconuts or can be tapped for sap. The Philippine Coconut Authority (PCA) also reports that their studies show that as long as half of the length of coconut spadix is not cut off and when properly managed it is possible to have the spadix produce both sugar and nuts. This is great news to the coconut farmers as well as those of us concerned about sustainability. I’m confident that in time we will come to know more about coconut palm sugar as it is rapidly becoming popular in our western health conscience society. Hopefully it will prove out to be environmentally sustainable and one of the best alternative sugars. Even then, it must always be regarded as sugar and highly recommended to only use sparingly. 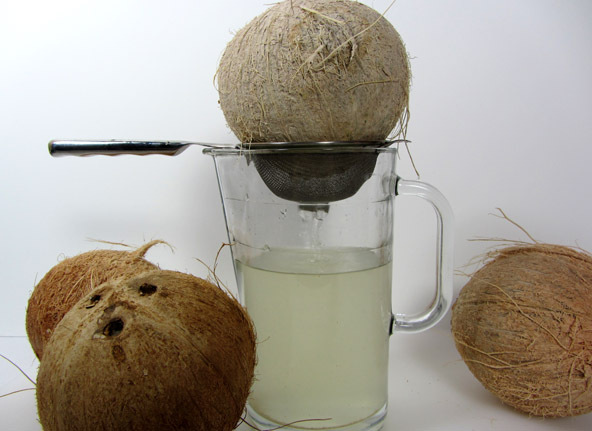 There are two ways to make coconut vinegar. One is from coconut water from the mature coconut and then fermented. The other is from the sap collected from the flower blossoms (the same sap as the coconut sugar is made from) and then fermented. 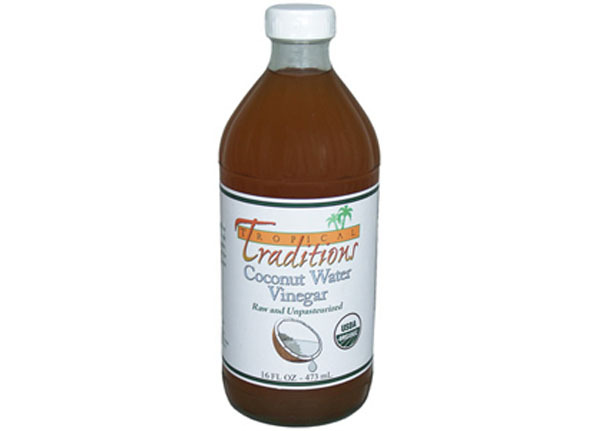 Because Brian W. Shilhavy, BA, MA of Tropical Traditions believes that once coconut blossoms are tapped it will prevent the coconut trees from bearing fruit (see coconut sugar controversy above) he provides vinegar made traditionally from coconut water. Coconut Secrets makes a coconut vinegar from the freshly collected sap of the coconut blossoms and then fermenting it. As you can see coconuts are used in a variety of ways and this is in no way a complete list. Coconuts continue to be an integral part of so many native dishes throughout the world. Somehow some of the English names became a little confusing in the translation along the way. I hope this article clears things up a bit and has inspired you to try a few recipes and coconut products found on this website. Just type in “coconut” in the search bar. 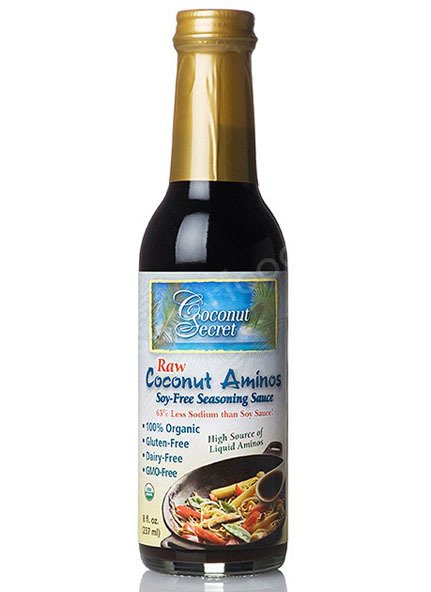 Coconut Aminos is like soy sauce and used in dressings, marinades and saute’s. It is made from the sap collected from the tapped coconut blossoms. It is an abundant source of amino acids, minerals, vitamin C, broad-sprectrum B vitamins, and has a nearly neutral pH according to Coconut Secret. Coconut Secret claims to be certified organic and raw- naturally aged and blended with sun dried, mineral-rich sea salt. Read more about it here.